^ Laitinen V, Lahermo P, Sistonen P, Savontaus ML (2002). 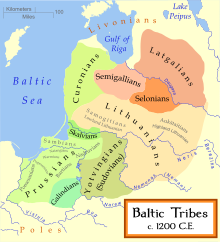 "Y-chromosomal diversity suggests that Baltic males share common Finno-Ugric-speaking forefathers". Hum. Hered. 53 (2): 68–78. doi:10.1159/000057985. PMID 12037406.